Attorney General Gurbir S. Grewal announced that a former New Jersey Motor Vehicle Commission clerk was sentenced to prison today for operating a scheme in which he accepted tens of thousands of dollars in payments in return for allowing over 200 people to obtain permits and licenses without passing required exams. Rodman Lora, 39, of Ridgewood, N.Y., a former clerk at the Lodi MVC Agency, was sentenced today to seven years in state prison, including two years and four months of parole ineligibility, by Superior Court Judge James J. Guida in Bergen County. He pleaded guilty on April 16 to charges of conspiracy (2nd degree), computer criminal activity (2nd degree), and tampering with public records (3rd degree). He forfeited his state pension and is permanently barred from public employment. Deputy Attorney General Christopher J. Keating prosecuted the defendants and handled the sentencing hearings for the Division of Criminal Justice Specialized Crimes Bureau. Lora was charged in an investigation by the Division of Criminal Justice Specialized Crimes Bureau, the New Jersey Motor Vehicle Commission and the Bergen County Sheriff’s Office. The investigation revealed that Lora altered MVC driver records for over 200 people between 2014 and 2016, enabling them to obtain various permits and licenses without having passed the mandatory written and/or driving exams, including commercial driver’s licenses with school bus and HazMat endorsements. In return, he received cash payments averaging over $700 per license or permit. The following three men previously pleaded guilty to third-degree tampering with public records in connection with the scheme. They also were sentenced today by Judge Guida. Luis Tiburcio, 46, of Passaic, N.J., was paid to act as a “runner” for Lora and bring him customers in the illegal scheme. He was sentenced to three years in state prison. Masood Ahmadi, 55, of Lake Hiawatha, N.J., is the owner of Ideal Transportation, a school bus company operating in northern New Jersey. He sent people seeking commercial driver’s licenses to Lora to obtain licenses through the scheme, including relatives and persons seeking employment with his company. He was sentenced to a term of three years of probation. Mark Hingston, 55, of Toms River, N.J., a private security guard at the Lodi MVC agency, obtained a commercial driver’s license with an endorsement, after Lora entered passing written exam scores for him. He received two years of probation and 100 hours of community service. Nine defendants were indicted with Lora, including the three men sentenced with him today and six others. Two pleaded guilty previously to tampering with public records and face sentences of probation: Carlos Vicuna, 37, of Elizabeth, N.J., was a “runner” for the scheme, and Jose Lora, 45, of Newark, N.J., Lora’s brother, received a commercial driver’s license without passing the written exam. Four defendants were admitted into the Pre-Trial Intervention Program. Beyond the indictment charging those 10 defendants, the investigation led to charges against 60 other customers and runners, bringing the total defendants to 70. Seven of those 60 pleaded guilty to tampering with public records and face probation, and 52 were admitted into the Pre-Trial Intervention Program. The investigation was conducted for the Division of Criminal Justice Specialized Crimes Bureau by Detective Cecil Boone, Sgt. Kelly Howard, Detective Jessica Marcacci and Analyst Terri Drumm, under the supervision of Sgt. Andrea Salvatini, Lt. Bill Newsome, Acting Bureau Chief Andrew Johns, Deputy Bureau Chief Jacqueline Smith, and Division of Criminal Justice Deputy Director Jill Mayer. The Motor Vehicle Commission uncovered the alleged scheme involving Lora and referred the case to the Division of Criminal Justice after an initial internal investigation and audit. Attorney General Grewal thanked the Motor Vehicle Commission’s Division of Security, Investigations & Internal Audit for its referral and valuable assistance. He also thanked the following agencies that assisted in the investigation: Bergen County Sheriff’s Office, New Jersey Department of Education, New Jersey Department of Labor and Workforce Development, New Jersey Department of Treasury-Division of Payroll, Lodi Police Department, and U.S. Department of Homeland Security. This case came to light through the efforts of NJ MVC Investigator 2 Johannes Segboer of the Security & Investigations Unit (SIU), under the direction of SIU Supervising Investigator Richard Stryker and SIU Chief of Investigations James Clifford. NJ MVC Information Technology (IT) personnel were also brought into the mix by SIU Supervising Investigator Gary Nucera, who realized the need for specific database searches to be designed and conducted in order to identify the full extent of the fraudulent activities perpetrated by Rodman Lora: IT Director Joseph Csolak, Administrative Analyst 4 Philip Fink, Administrative Analyst 3 Alyssa Rosenlicht and Administrative Analyst 3 Carol Sokolowski. Their assistance was of great value throughout. Even after the matter was referred to the NJ DCJ, Investigator Segboer and the NJ MVC IT Team continued to support DCJ in their investigation. Attorney General Grewal and Director Allende noted that the Division of Criminal Justice has a toll-free tip line 866-TIPS-4CJ for the public to report corruption, financial crime and other illegal activities. The public can also log on to the Division of Criminal Justice webpage at www.njdcj.org to report suspected wrongdoing confidentially..
A number of states have a variable component to their fuel taxes, typically designated either as a sales tax on fuel or as a part of the fuel tax itself, tied to fuel price or some other index. For purposes of the International Fuel Tax Agreement, states that have varying rates may change them no more frequently than quarterly. California, which has a large sales tax component embedded in its fuel tax, only adjusts its IFTA rate on diesel – that is, the per-gallon rate it charges per gallon on underpurchases or allows as a per-gallon credit on overpurchases in the state -- once a year, to reflect changes in prices in the interim since the last adjustment. Since this is done only once every twelve months, the adjustment can sometimes be quite considerable. And so it will be in 2018, when the California’s IFTA rate on diesel (the state does not require gasoline to be reported for IFTA) will jump from 57 cents a gallon to 70 cents on July 1, two weeks off. We don’t usually report adjustments in IFTA rates in the SLN before they take effect, but this change in California is so large, and affects so many trucking companies, that we’ve made an exception for it. Other changes in tax rates for the third quarter will be published in our quarterly fuel tax rate chart early in September. The NYS Thruway Authority is trying to get users of the NYS Thruway to fill out a survey about the services they provide and the services people would like to see. There is an entire survey dedicated for the opinions of commercial drivers. Considering the responses will help determine what changes the Thruway Authority will make to accommodate commercial drivers, please take a moment to complete the survey. Many thanks for your input. The American Transportation Research Institute (ATRI) today issued a data call for the annual update to its Operational Costs of Trucking report. Among the for-hire fleet metrics being requested by ATRI are driver pay, fuel costs, insurance premiums and lease or purchase payments. Carriers are asked to provide full-year 2017 cost per mile and/or cost per hour data. The results of this data collection, combined with the previous Operational Costs of Trucking reports, will yield 10 full years (2008 - 2017) of trucking cost information derived directly from fleet operations. This research provides carriers with an important high-level benchmarking tool and government agencies with real world data for transportation infrastructure investment decisions. "It's not hard to understand why ATRI's Operational Costs of Trucking report is among its most-requested studies - fleets large and small can use ATRI's analysis to identify ways to improve your operating efficiency. We look forward to participating in this year's data collection and encourage others to do so as well," said Mark Droubay, president of Double D Distribution in Salt Lake City, Utah. For-hire motor carriers are encouraged to provide confidential operational cost data to ATRI by Friday, June 22, 2018. ATRI's data collection form is available online at www.truckingresearch.org. The results of this study will be available later this year, however participating motor carriers will receive an advance copy of the report. Following a review of the requirements put in place in 2016 regarding the “Improve Tracking of Workplace Injuries and Illnesses” regulation, the U.S. Department of Labor’s Occupational Safety and Health Administration (OSHA) has taken action to correct an error that was made with regard to implementing the final rule. OSHA immediately notified State Plans and informed them that for Calendar Year 2017 all employers covered by State Plans will be expected to comply. An employer covered by a State Plan that has not completed adoption of a state rule must provide Form 300A data for Calendar Year 2017. Employers are required to submit their data by July 1, 2018. There will be no retroactive requirement for employers covered by State Plans that have not adopted a state rule to submit data for Calendar Year 2016. The dangers tractor trailer drivers face don’t end once they reach their destination. Whether at the warehouse, dock, or construction site, drivers are exposed to struck-by, crushed-between, and other safety hazards. The Occupational Safety and Health Administration (OSHA) is teaming with the trucking industry to raise awareness of these hazards, and help prevent serious and fatal injuries. According to data from the Bureau of Labor Statistics, at least 96 fatalities in truck transportation occurred in Midwestern states from 2015 to 2017. Thirteen of those fatalities appeared to be related to coupling (attaching) and uncoupling (detaching) trucks from the rig. 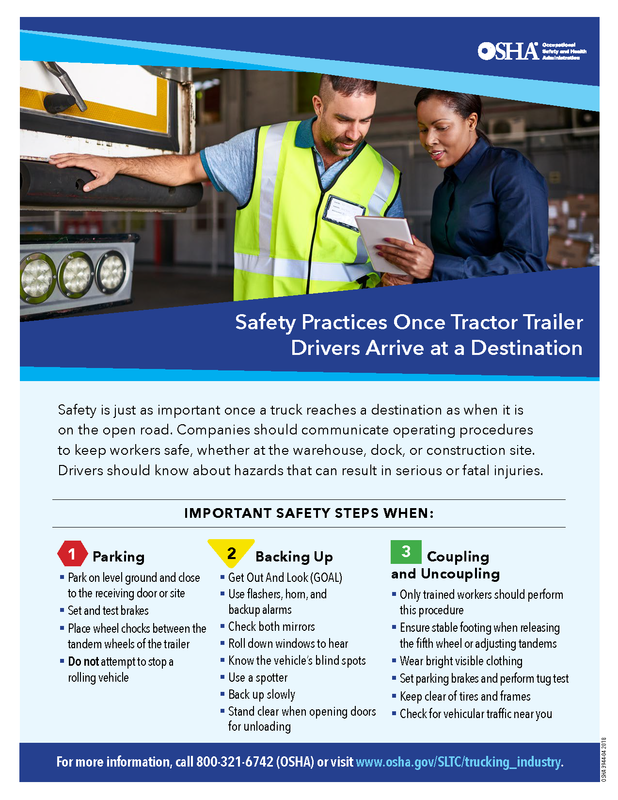 OSHA and the trucking industry developed a new flier that addresses the three most common hazards: parking, backing up, and coupling and uncoupling vehicles. Important steps include training workers to: park vehicles on level ground, set the emergency brakes, and place wheel chocks between the tandem wheels of the trailer to prevent the vehicle from rolling; and get out of the vehicle, and look for people and other obstructions before backing up. Visit OSHA’s Trucking Industry webpage for information on other industry hazards. The Pennsylvania Turnpike Commission today announced that it will postpone the Cashless Tolling go-live date for the Findlay Connector — the six-mile segment of Southern Beltway (PA Turnpike 576) in Washington and Allegheny counties. Originally planned for April 29, the go-live date will be delayed to later this spring or summer. The postponement provides additional time needed to continue testing of the tolling equipment at the highway speed (70-mph) electronic-tolling facility at milepost 2.6 on the Connector. This new Cashless Tolling zone, upon conversion, will replace six existing toll plazas located on the Connector’s on/off ramps. A new go-live date for the Findlay Connector will be announced in the coming weeks. The electronic-tolling technology being deployed on the Findlay Connector is installed on a gantry — a framework structure made of concrete columns supporting overhead steel beams. “Cashless tolling technology in general has been proven effective and is in fact successfully operating on dozens of toll facilities nationwide including two of our own pilot projects here in PA as well as in New York and Maryland, to name a few,” Compton added. The Pennsylvania Turnpike converted the Beaver Valley Expressway (Toll 376) to Cashless Tolling in April 2017 and the Turnpike Bridge over the Delaware River in January 2016. With Cashless Tolling, even drivers without E-ZPass no longer stop to pay; they proceed through the tolling location at the posted speed limit. As they do, cameras take a photo of the vehicle’s license plate, and a monthly PA Turnpike “TOLL BY PLATE” bill is mailed to the vehicle owner. The postponement will have no impact to the customer’s driving experience on the Findlay Connector, as the systems and operations involved do not alter travel patterns or accessibility. Conversion of the Keyser Avenue and Clarks Summit toll plazas on the Northeastern Extension (I-467) in Lackawanna County is still on target for an April 29 conversion. The Federal Motor Carrier Safety Administration (FMCSA) is ensuring the stability of the National Registry of Certified Medical Examiners (NRCME) website, the security of the data, and the privacy of drivers and medical examiners. This is of paramount concern. There was an unsuccessful attempt by someone to compromise the NRCME website. It is conclusive that there was no personal information exposed. Currently, there are several key features available on the National Registry. As of April 6, 2018, healthcare professionals wishing to become a certified medical examiner listed on the National Registry are able to register. FMCSA previously released a static look-up function allowing both State Driver’s Licensing Agencies (SDLA) and employers to check the validity of medical cards. Additionally, in February 2018, FCMSA corrected erroneous email notifications that were sent to certain medical examiners incorrectly stating that they would be removed based on out-of-date information. There are more than 58,000 certified medical examiners on the National Registry that can continue to perform medical exams on commercial truck and bus drivers. These certified medical examiners can continue conducting physical qualification examinations and issue a paper Medical Examiner's Certificate (MEC), Form MCSA-5876 to qualified drivers. Medical examiners should segregate all examinations completed while the functionality was offline and be prepared to upload them to the National Registry system when it is fully available, without penalties. FMCSA and UDDOT will continue to work to address these issues as the website is brought fully back online. For updates and status, visit the National Registry of Certified Medical Examiners website here. With the drayage industry suffering from a decade-long chassis shortage brought on by recessionary headwinds, the exit of ocean carriers from the business, and the enactment of the Roadability Rule in 2010, the opportunity exists for growth within the Industry regarding chassis and intermodal products. Conti understands these industry opportunities and is looking forward to expanding Hercules manufacturing platform within the drayage industry and other diversified industrial markets. Prior to joining Hercules Chassis, Conti was Vice President of Global Channel Sales with Belden Inc., a $2.4 billion revenue public company and global leader in network connectivity and cable solutions for various markets. Prior to BELDEN, Conti held operational leadership positions with several Private Equity owned manufacturing companies that support the Transportation, Vehicle, Aerospace, Military, & Data Communications markets. His early career leadership included Business Development activities with industry leading public companies including Corning and DuPont. As the saying goes, there simply is no substitute for experience! And, the Hercules team is positioned for continuous organic growth, developing new business opportunities and expanding their market reach. The Vermont Truck & Bus Association reminds carriers traveling on U.S. Route 4 in the state from the New Hampshire line to Vermont Route 100 that a state permit is required for combinations between 68 and 75 feet in length. The permit is free from the state department of motor vehicles, but being caught without one will be expensive. VTBA warns that Woodstock, Vermont, is particularly aggressive about enforcing this requirement. See here: http://dmv.vermont.gov/sites/dmv/files/documents/OSD-01-Excess_Length_App.pdf.